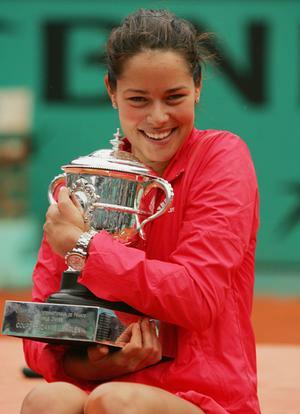 On 26th May, 2008, at the age of only 20 years old, Ana Ivanovic lifted the French Open title. Having only dropped 1 set in the tournament and gained the coveted world number 1 spot, the future seemed to be bright for the young Serb. However, in the 27 months since that triumph, she has only won one tournament – a minor tournament in Austria in October 2008. In fact, she has only reached one other final in that time. She now finds herself languishing outside the top 60 in the world, relying on wildcards to gain entry into the top tournaments. So where did everything go wrong for the talented Serb? Her early tennis coaching is as far from the typical upbringing that we could imagine. Having starting playing tennis at the age of five after watching compatriot Monica Seles on the television, her early training was disrupted by the NATO bombings of Yugoslavia in 1999. Forced to only train in the mornings, and in an abandoned swimming pool during the winter months due to a lack of facilities, few would have backed her to reach the big time. However, the first hints of the mental frailty that was to affect her later career were seen after she spent four hours locked in her locker-room crying after losing her first match in front of her new manager, fearing that he would drop her. However, he stuck with her, and remains with her to this day. In 2004, at the age of 16, she showed impressive form on the minor ITF circuit, winning 26 straight matches and all five tournaments that she entered. However, success on the major WTA tour was harder to come by. Her first major breakthrough came in Zurich, where she pushed Venus Williams to two tie breaks, squandering set points in both sets. She reached the last 8 the following week in Luxembourg in her final tournament of the year. Mauresmo and future French Open champion, Francesca Schiavone, saw her reach the last 8 of the Grand Slam for the first time, before defeat to eventual finalist, Nadia Petrova. A series of relatively disappointing tournaments followed, only reaching two further semi-finals, losing in both to Patty Schynder. After a promising start to 2006, beating Amelie Mauresmo in Sydney, she failed to reach the semi-final of any tournament until Montreal in August. She burst onto the scene in spectacular fashion putting together back-to-back victories against top 10 players, Dinara Safina and Martina Hingis, to take the most important title of her career thus far. She had high hopes for the US Open, but a defeat in the 3rd round to Serena Williams ended her interest in the tournament inside the first week. However, a series of quarter-final appearances in her last few tournaments ensured she finished the year ranked number 14 in the world. She had a turbulent start to 2007, losing in the third round of the Australian Open before splitting with her coach. She reached the final in Tokyo in the following tournament after victories over Jelena Jankovic and Maria Sharapova, but lost in two sets to Martina Hingis in the final. A difficult time followed before returning to Europe for the clay court season in May. This sparked a return to form as she won her second WTA Tier I title, beating Svetlana Kuznetsova in the final in Berlin – a result that forced her into the top 10 in the world for the first time. However, an injury picked up in the final hampered her preparations for the French Open. As seventh seed in Paris, she cruised through her first three matches, losing only 9 games en-route. Victories against the number 3 seed, Kuznetsova, and the number 2 seed, Sharapova, followed before a hammering against Justine Henin in the final, losing 6-1, 6-2. This match showed the first major cracks in her mental ability to reach the top of the game – she admitted that her nerves overwhelmed her, causing her serve to collapse. She was the sixth seed at Wimbledon, but progress was tough, saving 3 match points to beat Czech player, Nicole Vaidisova, in the last 8. She was unable to beat Venus Williams in the semi-final, losing in straight sets. Problems with a knee injury dogged her preparations for the US Open, but victory in Los Angeles improved her ranking to number 4 ahead of the Grand Slam. Having dropped only 9 games in her first three matches, she once again met Venus Williams. Once again, she was beaten in straight sets. She put the disappointment behind her to win her fifth career title in Luxembourg, consolidating her ranking of 4. 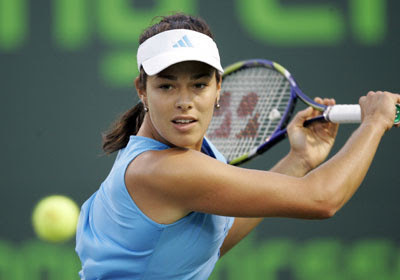 After several encouraging years, Ana targeted 2008 as her big chance to shine. She was the fourth seed in the Australian Open, before coming up against her nemesis Venus Williams in the last 8. However, this time she was able to up her game, picking up an impressive straight sets victory against the American. She recovered from a first set bagel in the semi-final to defeat ninth seed, Daniela Hantuchova, and set up a match with Maria Sharapova in the final. However, she was unable to win her first Grand Slam title, losing in straight sets to the Russian. Her performance did boost her ranking though, taking her to a career high of world number 2. A series of victories for Serbia in the Fed Cup followed, earning Serbia a place in the World Group II playoff later in the season. She continued her excellent start to the year by winning in Indian Wells after victories over Jelena Jankovic and Svetlana Kuznetsova. Howver, after failing to defend her title in Berlin, and a first round defeat in Rome, she headed to Roland Garros looking to improve on her final defeat the previous year. Progress was serene through to the semi-final, where she put on a shaky performance to beat Jankovic in a thrilling three-set match. She finally managed to seal her first Grand Slam title at the third attempt, beating Dinara Safina in straight sets. Despite going into Wimbledon as the top seed, she had to battle hard, saving 2 match points against Nathalie Dechy in round 2, before losing to world number 133, Zheng Jie. A difficult period followed as she struggled with injury, losing her number 1 ranking, and forcing her to withdraw from the Beijing Olympics – one of the worst moments of her career in her words. She came into the US Open with a lack of match practice behind her, although she was still the top seed. However, a second round defeat to Julie Coin followed – the earliest exit by a top seed in 35 years. A semi-final defeat in Zurich, before victory in Linz suggested that she was rediscovering the form that had propelled her to the top of the women’s game. However, a third round exit in the Australian Open followed early in 2009. After defeat to Serena Williams in Dubai, she split with her coach, Sven Groeneveld. Early signs appeared promising as she returned to Indian Wells to defend her title. She breezed through to the final for the loss of only one set. However, she was defeated by Vera Zvonareva in the final in straight sets. At the time it would have been almost unbelievable, but this was to be her last appearance in a final to this day. She played only two games on clay in preparation for her defence of her French Open title, beating Francesca Schiavone before losing to Agnieszka Radwanska in Rome. She appeared to have returned to form, cruising through her first three matches in Paris, before being stunned by Belarusian ninth seed, Victoria Azarenka, in straight sets. This defeat meant that she dropped out of the top 10 for the first time in over two years, and prompted another change of coach. Having saved match points in her first round match at Wimbledon, she reached the fourth round before facing Venus Williams. After losing a one-sided first set, she landed awkwardly after a serve at the beginning of the second set, and she was forced to retire in tears, despite attempting to continue. She returned to action 6 weeks later, losing in the second round in Los Angeles, before successive second round exits in Cincinnati and Toronto. She suffered her first ever first round defeat in a Grand Slam in the US Open, losing to Kateryna Bondarenko. Her new serve motion was severely criticised, with Pat Cash labelling it ‘painful to watch’. Another first round defeat followed in Tokyo followed before she pulled out of the China Open and announcing that she was taking the rest of the year off. The year was her worst as a professional, winning back-to-back matches only six times throughout the year, and finishing ranked number 21. She began 2010 in promising form, reaching the semi-final in Brisbane – her first semi-final appearance in almost a year. However, a straight sets defeat to the returning Justine Henin prevented her reaching the final. She crashed out of the Australian Open in the second round, having led Gisela Dulko by a set and a break, finishing the match in tears as her game collapsed. 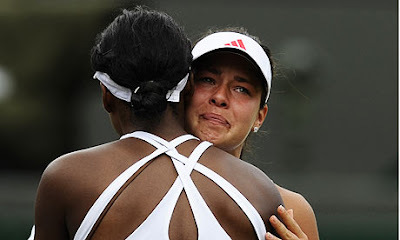 Things continued to get worse for Ana, losing both her Fed Cup matches against the Russians, and splitting with her coach for the third time in less than twelve months. A first round defeat in Indian Wells followed as her serve continued to desert her – the first time in her career she had suffered four consecutive defeats. This result dropped her 30 places in the world rankings from 28 to 58 – the first time outside the top 50 for over five years. In Miami, she recorded her first win in over two months, beating Pauline Parmentier, but lost to Agnieszka Radwanska in the second round. After a month out, she began her clay court season, hoping for a change in fortune, but lost in the opening round in Stuttgart to Radwanska again. Expectations were low going into Rome, but a series of unexpectedly impressive performances followed, recording victories over Azarenka, Dementieva and Nadia Petrova, before defeat in the semi-final. Regardless, it was her best tournament performance for nearly two years. This performance gained her a wildcard entry into Madrid, but she collapsed from a set and a break up against Jelena Jankovic to suffer another opening match defeat. She entered the French Open unseeded for the first time in five years. However, disappointment was to follow as she collapsed to a 6-3, 6-0 defeat to 28th seed, Alisa Kleybanova, in the second round. A first round defeat in Wimbledon followed, before disappointing performances in both Stanford and San Diego. This week in Cincinnati, she looked to be slumping to another defeat, having gone 6-2, 5-3 down against the in-form Victoria Azarenka. However, she dug deep, finding some of the mental resolve that has deserted her over the past two years to mount a magnificent comeback, taking the second set on a tie break, and winning the decider 6-2. Later today, she faces Yaroslava Shvedova, bidding to win consecutive matches for the first time since May. So what caused the monumental collapse in form since winning the French Open back in 2008? Since that highlight at Roland Garros, she has only won 49 of the 86 matches that she has played. The major problem in her game has been the disintegration of her serve, stemming from issues with the ball toss. When she gets nervous, her ball toss goes, and thus her entire game collapses. For example, if we look at her defeat in the Australian Open this year, she won only 54% of the points on her serve, delivering 11 double faults and being broken nine times. She hit 75 unforced errors as she tried too hard to overcome the problems she was having on serve. These problems on serve have developed as a result of constant changes in coaching over the past two years. Having gone through four different coaches in less than twelve months, she received constantly conflicting advice, leaving her totally confused. These problems have led to a lack of confidence, which has led to further problems with her serve – a vicious circle. She has also been criticised for over-analysing her defeats, rather than accepting them and moving on. Her stunning looks have also led to attention off the court. She has become a huge favourite with the glamour magazines, and the large number of photo shoots has been suggested to be affecting her game. Whether this is a major reason is debatable, but it certainly takes some of her attention off her tennis. Despite her recent problems, it is important to remember that Ana Ivanovic is still only 22 years old. She has found it difficult to cope with the attention and success that she has received at such a young age. The pressure of being a Grand Slam champion and world number 1, as well as a hugely attractive and popular figure, is difficult to handle for anybody. She had to attempt to cope with this at the age of only 20. A series of injuries and questionable advice concerning her coaching have also affected her development in the game. At the moment, a lack of confidence in her own ability is the underlying problem behind her recent travails. If she can regain that confidence, the nerves will reduce, which in turn will allow her to get her serve back on track and working properly again. She is undoubtedly a highly talented player – three Grand Slam finals, one Grand Slam title and 12 career titles have not been achieved by luck. However, whether she can find the right coach and team around her to lead her back to the top of the game is still to be seen. She remains a hugely popular figure within the game, and it is a shame to see the problems she has been having over the past two years. Victory against Shvedova tomorrow would set up a match against either Elena Vesnina or Francesca Schiavone – a match that Ana would go into with confidence, having beaten both players back in May, and never having lost to either. Compatriot Jelena Jankovic would likely wait in the quarter-final – a player that Ivanovic has a 7-3 winning record against. Whilst two years ago, you would have confidently put money on Ana to progress through these tests, today it would be a brave man to back her in any match that she plays in. However, we wait with baited breath to see how see responds tomorrow – could it be the beginning of a revival, or merely another false dawn?